The husband and I were driving home after Uni this evening, we’ve finished exams for the term, and were frankly quite exhausted. We weren’t hungry, just peckish and I had a sudden craving for Khaman. A quick phone call to my mother-in-law and we had recipe in hand. The Khaman was beautiful, and what an incredible colour! Just what we needed to celebrate end of exams. I am ashamed to say, I finished 3/4 of the plate. Mix everything except the Eno to create a pancake mix consistency. Grease a tray or platter with oil. Setup your steamer. Once the steamer is ready, add the Eno to the mix with a little water and stir well. Pour into your greased plate, and steam for about 20 minutes. A knife inserted into the centre will come out clean when the Khaman is ready. Let Khaman cool slightly, and the cut through in desired shape – don’t remove pieces from tray. Heat oil, add mustard seeds. Once mustard seeds spluttered, add everything else. Remove from heat, add water and stir well. Pour this mixture over the prepared Khaman. 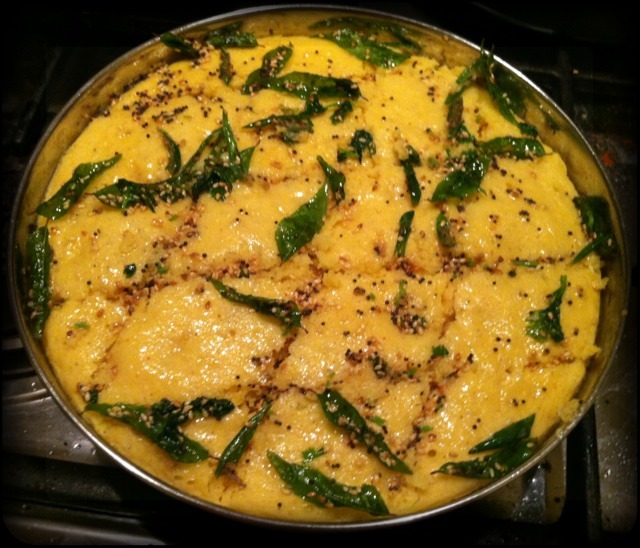 Ensure you spread evenly as it’s the oil mixture that makes the Khaman moist. It seems similar to dhokla. Am i rite?